Mint Legacy of Genesis (AHR 32046-11) was born May 1st, 2011. Mint Legacy, who is fondly known as ‘Lacey’ actually represents a third generation of Genesis Farm breeding on both sides of her pedigree. Her sire, Alfa of Genesis, was imported from Holland as a weanling by Genesis Farm. Alfa is the highest AHR inspected stallion ever in North America, scoring a record-setting 82 points earning his AHR GOLD classification and becoming only the 2nd stallion in AHR history to earn such a title. Alfa was the AHR Futurity Champion as a yearling, 2-year-old and then again as a 3-year-old. In 2010, Alfa became the AHR ‘National Champion Stallion’ for the third time, becoming the only stallion to ever accomplish this feat. Alfa was the 2011 pleasure AHR SIP ‘Stallion of the Year’. Lacey’s dam is the multiple-time AHR Futurity champion, Mint Edition MLF. Mint Edition won her Futurity class as a weanling, yearling, 2-year-old and then again as a 3-year-old. She is AHR Silver classified with 77 points. Mint Edition is sired by our very own Arno van het Nieshof, who is the only AHR ‘SUPREME Status’ stallion in the country. Her dam is the multiple-time Futurity champion, Mint Julep MLF. Mint Julep actually won her GLHA Futurity class a weanling, yearling and then again as a 2-year-old. 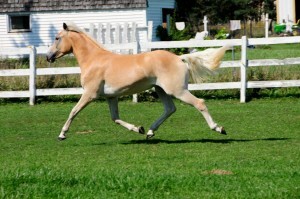 She was one of the most prized breeding products of Bob and Bea Wallace of Meadowlane Farms, author of the reknown book ‘ Haflinger Horses in North America and the People Who Belong to Them, 58-1999’, who are now retired from breeding haflingers, but whose impact on the breed can still be seen today. Lacey’s bloodlines are as notorious as it gets in the modern world of haflingers—both of her grandparents and her parents reside at or have resided at Genesis Farm. The sire and the grand-sires’ track records for producing champion offspring are second-to-none. In addition, the maternal line is obviously a dominant one for show ring winners based on Lacey’s dam and her grand-dams’ own personal Futurity championship titles. We love the maternal line so much and hold it so sacred in our breeding program that we have made a tradition of naming all of the fillies in this maternal line with a name that starts with “Mint”. To an outsider, this may seem a bit redundant but to us, it is a way to definitively express the caliber of these foals. Mint Legacy of Genesis made her show ring debut at the 2011 AHR Futurity. Lacey took 4th place in the competitive pleasure ‘Junior Weanling Filly’ class out of 13 entries; the class was eventually won by her stable mate, Myriam GHJ, who went on to be named pleasure ‘Junior Champion’. In the large and well-attended pleasure SIP class, Lacey took 6th place out of 24 foals! 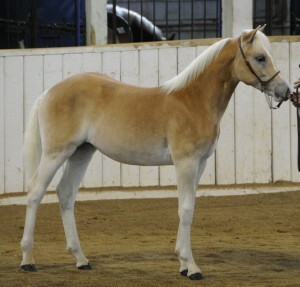 Her placement in this class helped to earn her sire, Alfa, the title of 2011 AHR pleasure ‘Stallion of the Year’. 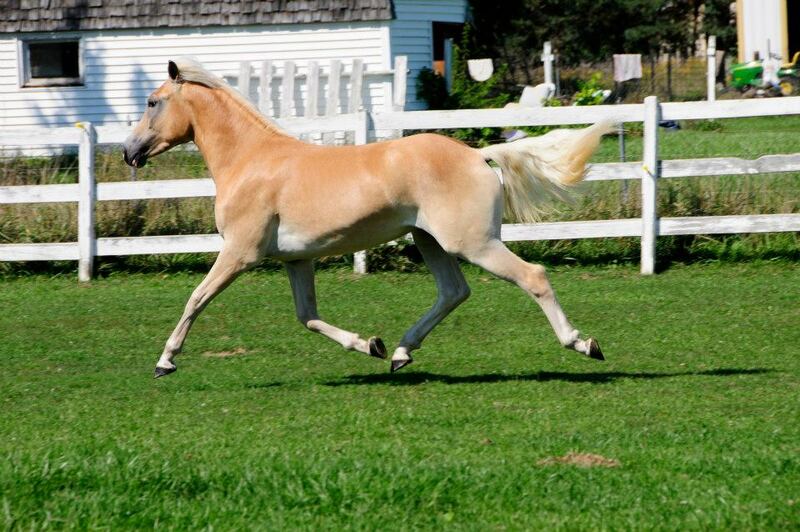 Lacey has inherited Alfa’s metallic gold color and her personality is as sweet as honey. We joke that she has so many generations of champion show horses behind her that she was just born ‘knowing how to show’—she seemingly was born already knowing all of her basics from haltering to leading to being tied and is a joy to work with! She is very clean and dry in the bone and one of the best moving haflinger foals we’ve ever seen, both traits of which are dominant through her maternal line. She will stay on at Genesis Farm to represent the third generation of our selective breeding program.